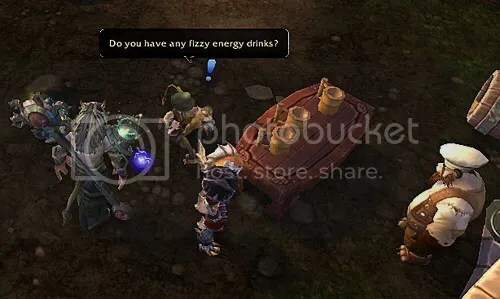 I had fun with the Monkey King’s rhyming and riddles in the questline to get Fu Zan. One of these days, I really need to do the Alliance side of the Patch 5.1 questline, and see how Anduin got along with the Monkey King. I’m not sure how much I like the appearance of this weapon, though. Even though all that bouncing and swinging and joggling may be reasonably realistically animated, from a physics standpoint, it’s too much — it’s enough to be distracting. 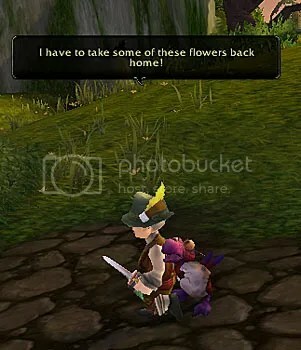 I like the simpler staff-with-kettle design from the low-level Monk class quests better. 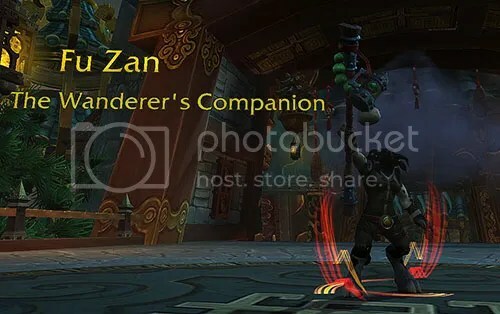 Probably my favorite appearance for Fu Zan is the Hidden one — so until I can get that, I might Transmogrify it into one of the low-level staves. 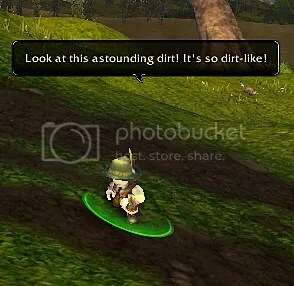 Seeing the locations in Pandaria that come under Legion attack during the opening scenes of the Monk class campaign really hit me in the feels. 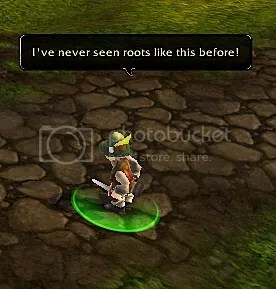 Somehow it felt like after all we (the Horde & the Alliance) had put the Pandaren through with the Sha and all, having the Legion show up there just adds insult to injury. 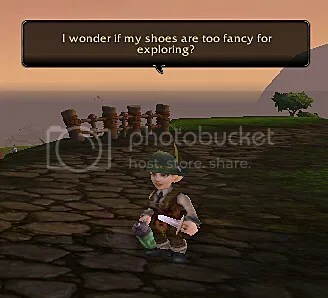 Getting to go back to the Wandering Isle for the Monk Order Hall is a treat, though. 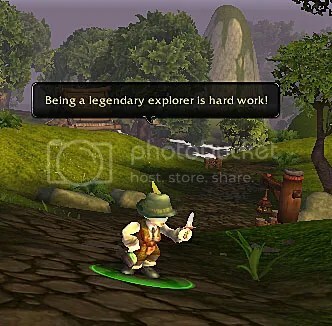 I’m glad that that wonderful zone is getting to be seen by more than just low-level Pandaren. I explored all over and found that the only place I couldn’t get to was the Wood of Staves. There’s a barrier at the gateway to that area that newbie Pandaren have to pass a trial to get through; that barrier was up and seemed to be supplemented by a fel-tinged layer… I wonder if I’ll have to deal with that at a later stage of the Monk campaign? 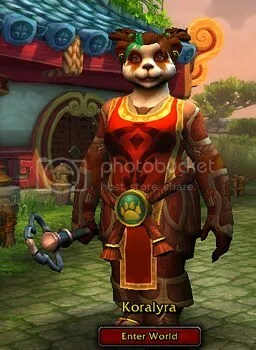 Or is that barrier down for a Pandaren Monk character who started as a Pandaren at level 1 on the Wandering Isle? A lady at church was wearing a pretty netted shawl that I wanted to draw, and it seemed like the sort of thing that a Pandaren might like. This finishes up Spring Break Art Week and all the art I had in my backlog, so the next time I want to post art, I’ll have to have drawn something new. I love the ringlets of the Draenei “Jeweled Band” hairstyle. I love the ringlets of the Goblin “Elegant” hairstyle. I would love, love to see the Barbershop make these hairstyles available to more races. Wouldn’t those long Dranei ringlets look just lovely on a Blood Elf, Human, or Night Elf? 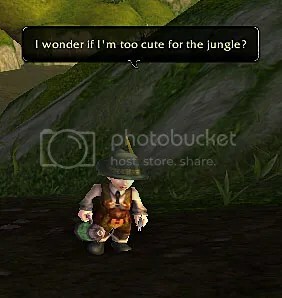 And wouldn’t those fat Goblin curls look simply adorable on a Gnome, Dwarf, or Pandaren? — but I realize that that’s far, far less likely to happen than getting ringlets for the more Human-like races. 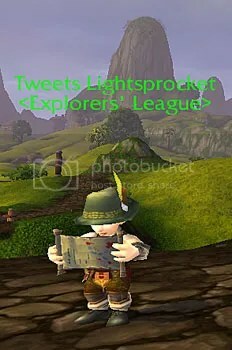 Tweets Lightsprocket patrols the road between Halfhill and Zhu’s Watch. How did Tweets become acquainted with Tina Wang and Uncle Gus? These two pandaren reside in the Horde’s Shrine of Two Moons. Were they originally intended to reside in the Alliance’s Shrine of Seven Stars, instead, and got mixed up somehow? Well, now that I don’t have the Legendary Cloak haunting me as unfinished business anymore, it feels like the leveling floodgates have opened. In the past few days, five alts — including a brand-new one — have gotten some serious playtime. 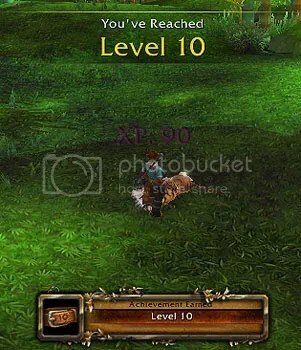 Kaelinda the Blood Elf Mage, who’d been sitting at about halfway through level 88 since she accomplished her goal on the Molten Front, pushed through a bit of the Townlong Steppes, some of the Dread Wastes, and a few dungeons to become my tenth level 90 character. Kilauea the Troll Shaman went from level 22 to level 25, putting her right at-level to do Arathi Highlands and then the Hinterlands, two zones which I have not yet quested through since Cataclysm. Kalaneia the Blood Elf Warlock went from level 55 to level 58. She might have gotten to level 60, but then I got distracted…. Tome and I took our wee Dwarf lassies, Flaminga the Warlock and Kjerstin the Shaman, to the Wetlands and played through most of the first major hub there before Tome had to sign off. Kjerstin is already overleveled for the zone, so she didn’t quite get a level out of it, but I really want to see the storyline. When BTH and I began leveling our Monks, I joined BTH’s guild with my Monk so that we’d have the same guild XP bonuses — my personal guild wasn’t yet leveled enough to have all of those perks. 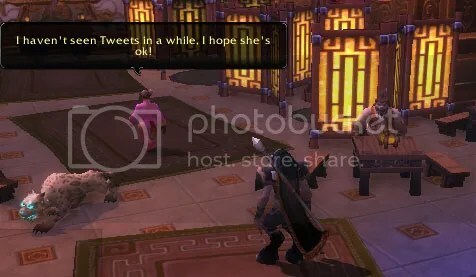 That meant, however, that my little all-Tauren guild has been missing Monk from the “Classy Tauren” achievement. My guild is now leveled enough to have all the XP perks, so I moved my Monk over to it… but that did not give me the ‘chieve. 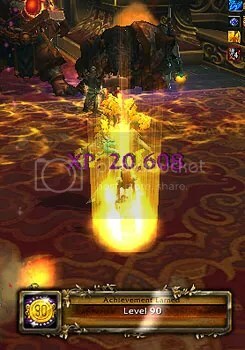 It seems that I have to actually ding 85 with the class-race combo in-guild to get the ‘chieve credit. So I rolled a new Monk. 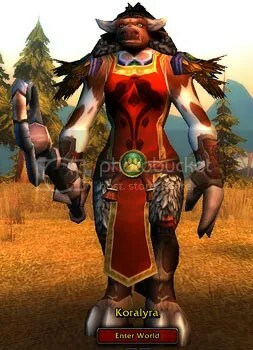 I started her as a Pandaren, so that she could have the cool Wandering Isle leather gear for RP wear, then race-changed her after she got to Kalimdor. She is going to level primarily through LFD, Archaeology, and Pet Battles. And though I haven’t managed to give her any playtime yet, Kelisanna the Blood Elf Rogue wants to level, too. BTH gave me Mistborn for my birthday, and Keli is still too low-level even to acquire the Survivor’s Bag of Coins, let alone use it.